Carved Granite Bears, Pigs & Mice statues from J.H. Wagner & Sons. Inspiration for granite carvings is only limited by the imagination, with the diversity of products and skills available from J.H. Wagner & Sons we challenge you to create the unusual, dream of the magnificent and maybe even recapture some of those wonderful memories of youth. From the design of a children's play area to a private landscape with a touch fantasy we can assist you with quality granite sculpture pieces either from stock at JHW Toowoomba and Brisbane or with pieces custom created to your needs. 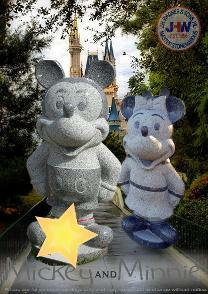 Mickey and Minnie Mouse pieces are not currently available in stock from JHW but will be manufactured to order. Mickey and Minnie sculpture pieces already supplied by JHW can be enjoyed at Laurel Bank Park Toowoomba near the Margaret Street playground area. Prices shown below for Four Pigs, Panda and Cub, Bear and Small Bear Cub are for sculpture pieces ex stock. Stocks may change at any time and we reserve the right to amend prices without notice.